It happens from time to time that avi video files are corrupted. This is usually noticed during playback. Some problems that can occur are freezing or distorted images which is usually caused by bad frames. Another problem that can occur is that it is not possible to play the movie from any position because of a bad index file. This could have happened during the creation of the video which usually means that the problem cannot be fixed by downloading the file anew. DivFix++ is a portable Open Source avi fixer for Windows, Linux and Macintosh computers. It comes with a graphical user interface and a command line version. The graphical user interface is probably the most comfortable. Videos can be dragged and dropped into the interface or added by using the file browser. A click on the check errors button will scan the video files in the queue and display information if errors have been encountered. A few settings are necessary before videos can be fixed. The first is to set a path for the fixed video files. A few additional settings are optional. Bad parts are cut out by default which could result in skips during playback. Probably still the better solution than a video that is stopping and not continuing afterwards. Errors can be written to a log file for further analysis but they will also be displayed in the log window. A click on Fix will try to fix the video files in the list. 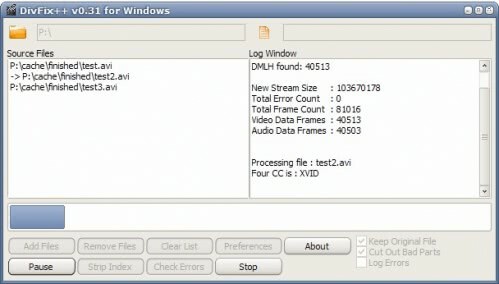 Other possibilities are to strip or rebuild the index of selected video files. Update: DivFix is no longer available on the Sourceforge website. The program can now be downloaded at the new website where it is offered free of charge. The functionality has not changed, the program is however still under active development. I’ve been using this for some time now. Works great. More people should know about it and they will now. AsfBin is similar but for cutting out fragments, joining, editing and repairing ASF files. Good for those WMV files. i want to fix simmmsons movie. during playback movie stops at 30 seconds. i fixed it but the new file only plays for 39 sefconds.